Steve Bishop was introduced to the life insurance business by his father who was a career agent with National Life Insurance Company. 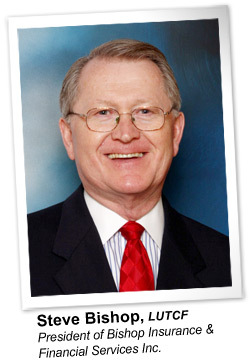 After serving in the U.S. Navy, he started his career in the financial services industry in 1971 in Atlanta, Georgia. During his 30 year career with American General Insurance Company, Steve was consistently one of their leading advisors. He was a recipient of American General's most prestigious honor, the Donald J. Tasser Award of Excellence. In 2001 Steve realized that the financial services industry was constantly changing and that one company could not meet all of his clients' needs. Bishop Insurance & Financial was established to serve both the insurance and financial needs and goals of his clients. He has dedicated his entire career helping his clients meet and exceed their expectations. Steve's goal is to assist each client individually in protecting, preserving and growing their assets in the most tax-efficient method. Steve has been married to his wife Sue for 40 years. They have two adult sons, Stephen and Stuart. He is an ordained deacon of Pinecrest Baptist Church, in McDonough, GA where Steve and Sue have actively served for 36 years. He enjoys nature, traveling and reading.